Why is Sanyo Attached as a Water Pump?  Home  Business  Why is Sanyo Attached as a Water Pump? By becoming a political prisoner, former Brigadier General Suhario Padmodiwirio, aka Hario Kecik, often plays sports while filling up with water. "A thousand times the movement of the handle of the pump with the right hand and a thousand times with the left hand.I introduced a cubic meter in the pond," said Kecik, one of the characters of the Battle of Surabaya at Memoar Hario Kecik (1995). Kecik's habit of pumping water by hand every morning brings her into shape. Once, Major Soemarno - who was in charge of taking care of where Kecik was being held - came to see him. The half bad news approached Kecik. Major Soemarno intends to replace the manual water pump with an electric water pump. "I objected that the change of pump would mean he would take the only sporting tool I really needed," said Hario Kecik. The major laughed. 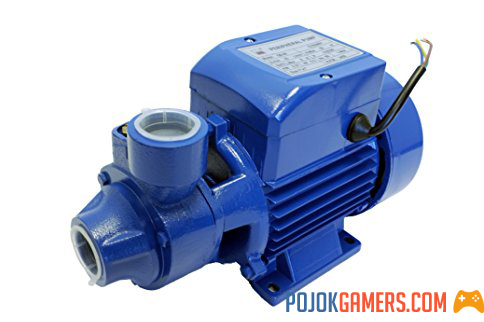 Electric water pumps, often referred to as jet pumps, are certainly considered effective for filling water tanks rather than manually. Incidentally, at that time, the chosen water pump was the Sanyo brand. The name that is so attached to water pump products. Besides Sanyo, there are now various brands of water pumps on the market, including Shimizu, Panasonic, Hitachi and others. However, whatever the brand, all water pumps in Indonesia are still called sanyo. According to Firman Lubis in the 1950s in Jakarta: Memories of Adolescence (2008), many electric water pumps were installed in the 1970s in Indonesia. After decades, "all brands" of electric water pumps are also called Sanyo, for Indonesian consumers. In everyday conversation, it's common. "The water in the bathtub is running out, turn on the sanyo!" Sanyo has almost become a word representing an electric water pump. Similar to the Honda brand for motorcycles, Odol for toothpaste. "Most people with generic names (those) are pioneers in the category of each product," wrote Hermawan Kertajaya in Hermawan Kertajaya on Brand (2007). Sanyo is a Japanese brand that does not only manufacture water pumps. This company has at least made radios, washing machines and other electronic devices. Sanyo, according to Yoshiko Nakano in Where There Are Asians, There Are Rice Cookers (2009), was founded in 1947 by Tashio Iue, brother-in-law of National founder, Kanasuke Matsusita. Before founding Sanyo, Tashio Iue had worked for the national company and was released in 1946. The company was incorporated in 1950. The name Sanyo, in Japanese, means three oceans. On Earth, there are three important oceans: Atlantic, Indian and Pacific. As the name suggests, it is not surprising that Sanyo products reach Latin America in the Indonesian market. According to the bookKey Players in the Japanese electronics industry (1985), Kanasuke Matsusita of Tashio Iue also manufactured tools for bicycle lighting. In 1952, Sanyo released his plastic radio. The following year, Sanyo made a washing machine. After that, Sanyo manufactures water pumps, fans, air conditioners, TVs, LCD screens, rice cookers, washing machine batteries and projectors. In Indonesia, Sanyo has also expanded its industry. "PT Sanyo Indonesia Industries was established in 1970 in Sunter and produces a variety of household items such as refrigerators, fans, TVs, washing machines, etc.," Majalah magazine (1989) writes. Before Sanyo won Indonesia, the company, the founding brother of Sanyo (Tashio), Matsushita Electric Industrial, had been linked for the first time in Indonesia in 1960 by Radio Manufacturing Transistors, which are still owned by local partners in China. Indonesia, via Gobel, with his friends. After 1965, many joint ventures were built by Gobel and Matsushita.